Medium (8-10) - $33.99 Large (12-14) - $33.99 Only 1 left! What’s that yellow flash? It’s the Golden Blur! The Human Hi-Liter! Perfect for blending into all-yellow environments! Okay, maybe there aren’t a lot of those, but it is perfect if your kid just loves yellow. Maybe they want to be Green Man from It’s Always Sunny in Philadelphia’s little-known new sidekick “Kid Yellow!” (Hey, you probably shouldn’t let your kid watch that show.) It’s perfect for showing fandom for a sports team whose uniform includes yellow. Wear it under your Penguins, Pirates, Stealers, Lakers, Vikings, Warriors or other jerseys! Get yourself 6 other ones and color code your week; never think about what you’re going to wear again. It’s like a 21st-century Garanimals! Everybody’s always wearing jumpsuits in things that take place in the future, right? 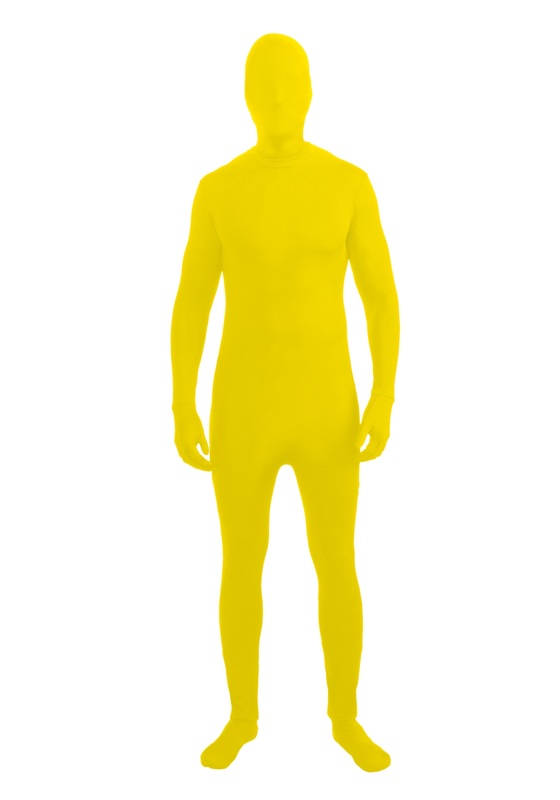 Get your child prepared for the inevitable human uniform now with this yellow second skin. This second skin is designed to do just that––cover the entire body. You have skin on your face, don’t you? So you need second skin there. Presumably, from our experiments putting book covers over our heads back in middle school, it’s plenty see-through, so your child can rip around to their heart’s content without showing their face. It’s perfect for when you need to take them out but you just can’t get them to shower or put normal clothes on. Maybe you’re not a child but you just want your zentai suit really, really tight. Well, no guarantees, but this might be what you’re after. Our Yellow Second Skin is 92 percent polyester and 8 percent spandex stretch knit for that added elasticity. The suit opens in the back and closes with Velcro. You won't actually be trapped in this as your second skin forever. Unless you want to be.